Product #20741 | SKU AJ-PX5000G | 0.0 (no ratings yet) Thanks for your rating! The Panasonic AJ-PX5000G 2/3" ENG Style Camcorder with P2 & microP2 Media Card Slots is a full sized ENG style HD camcorder with an interchangeable lens system that captures Full HD video to P2 or micro P2 media cards. The camera records HD Video in either NTSC or PAL compatible frame rates, to the AVC-Ultra family of codecs. In addition to the two microP2 slots and two standard P2 card slots, the camcorder incorporates an SD card slot for proxy/metadata recording. The camera body incorporates a 9 cm flip out LCD screen and can accept optional B&W or Colour Viewfinders. The camera is well suited to capture breaking news as it records approximately 8 seconds of video in standby mode, so you can record about 8 seconds of video before pressing the record button. For long developing news situations, you can record in loop mode, letting the camera record to your data cards and then start recording over allocated space on the cards. It records using codecs that include AVC-Intra and 10-bit AVC-LongG50/25 and supports Dual Codec recording with the Full-HD resolution of 1920 x 1080. Incorporated image control tools include: CAC (Chromatic Aberration Compensation) when using a CAC compatible lens, DRS (Dynamic Range Stretch and a choice of 7 Gamma selections. The camera features digital zoom, an electronic shutter, two rotating optical filters, focus assist, Zebra, Y-Get, a simplified Waveform and Vectorscope display, and five user assignable function buttons. 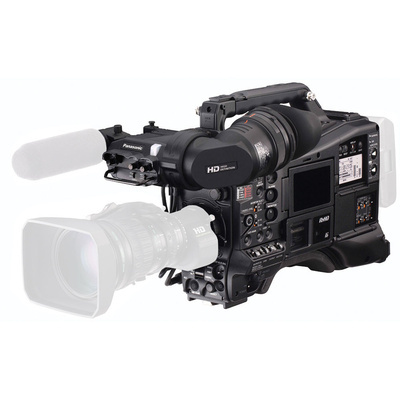 The camera features 3G-SDI inputs and outputs, allowing you to pass feeds from and to other cameras, and a slot for optional two channels wireless receivers. A wired network port allows you to remotely control the camera using an optional studio remote panel. The built-in USB 3.0 port allows high-speed file copying to compatible storage media of 2TB or less directly from the camera without requiring a computer. The camcorder features a 2/3" lens mount that allows you to use a interchangeable lenses. No lens is included with the camera. The built-in 9 cm colour LCD serves as a monitor when shooting, displays menus, and provides Waveform and Vectorscope displays. After recording, clips selected from clip and thumbnail displays can be played or deleted (single or multiple clips). In addition to VTR-like pause, fast-forward, and rewind functions, multiple clips can be consecutively played in any desired sequence for transmitting data from the shooting location. Optional colour and black & white viewfinders are available for this camera. The camcorder records at interlaced compatible frame rates, allowing your video to play back on progressive and interlaced HD video systems, as well as be easily converted to play back on SD video systems. 2.2MP, 2/3-type MOS image sensor achieves F12 (at 59.94 Hz) or F13 (at 50 Hz) sensitivity and 60 dB signal-to-noise ratio. The camera supports two full sized P2 cards and two microP2 sized cards, providing you the flexibility to use your P2 cards or if you wish, migrate to the microP2 format. AVC-LongG50/25 and AVC-Intra100/50 codecs provided as standard features. AVC-LongG50/25 codecs achieve 10 bit/4:2:2 image quality at a data rate of approximately 50/25 Mb/s. The camera supports 23.98, 29.97, 59.94 frame rates, as well as 50p, 50i, and 25p. The frame rates of 23.98, 25, and 29.97 can be recorded as native frame rates, or as a pulldown recording which interpolates the data as a 60/50i recording. You can select to record 23.98 (24) fps with a 24PA (pulldown advanced) recording scheme, which alters the 3:2 pulldown sequence from 3:2:3:2 to 3:2:2:3 field order, which makes it less computing intensive to convert the pulldown sequence to a native 23.98 (24) fps sequence for editing. Please note that the 24PA pulldown sequence can result in jumpy looking images during normal playback and require that your footage be imported into your NLE correctly for viewing/editing. Simultaneous recording to two media cards creates an instant backup of your recording. The camera is capable of recording and playing 1080/59.94p and 1080/50p progressive images (AVC-Intra100 and AVC-LongG25 modes). While recording with the AVC-Intra100 or LongG50/25 codec, you can simultaneously record with the AVC-LongG6 low-bit-rate, HD codec. The 3G-SDI input and outputs allow you to daisy chain your camera with other cameras to share a single feed, useful when shooting press conferences that is providing a single feed. 3G-SDI output #1 supports 3 Gbps, providing 1080/60p and 50p progressive full frame image output. It allows Rec Start/Stop linked backup recording with an optional Panasonic recorder equipped with SDI input. 3G-SDI output #2 is separate from output #1 and supports HD-SDI or down-converted SD-SDI. The aspect ratio can be selected from among Side Crop, Letter Box, or Squeeze mode when down-converting and outputting from SDI OUT1/SDI OUT2 terminals. The HDMI connector allows digital A/V output to a wide range of devices with both professional and consumer specifications. The camera does not include a microphone, but accepts a variety of optional, compatible, professional mics with a 3-pin XLR connector using an optional 3-pin XLR cable. The AJ-PX5000G offers 4-channel audio in all recording modes. Each channel input can be selected from FRONT (mic), REAR (line) and WL (wireless). The level volume control also supports 4 channels. The large audio dials (4 channel) feature a push lock function. The Audio Input level adjustment (front) can be switched ON/OFF and allocated to desired channels. The AVC-Intra or AVC-LongG modes support 24 bit digital audio recording. Y-GET: Measures brightness at centre and displays numerical data. Dynamic Range Stretch (DRS) provides a wider dynamic range with minimal blown highlights and blocked shadows. Chromatic Aberration Compensation (CAC) function works with a CAC-compatible lens. Focus Assist: Features Focus in Red, Expand, and Focus Bar display functions. Focus in Red and Expand can be allocated to User buttons for one-touch control. Five user assignable buttons on the camera body allow you to quickly access your most used functions. The USB port supports USB 3.0 as a host, and USB 2.0 as either a host or device. You can connect an optional (AJ-WM30) wireless module that allows wireless LAN (IEEE802.11 standard) connection for tablet or smartphones linking. Setup Files: Eight camera setup data files (including four scene files) can be saved on an SD/SDHC/SDXC memory card. The camera features a built-in Timecode generator/reader, and a Timecode in and Timecode out connector. The Genlock connector allows you to sync this camera with other optional cameras for multi-camera shoots. The UniSlot is compatible with available 2 channel wireless receivers. The XLR audio input supports 2 channel mic/line inputs providing +48V phantom power supply. The camera is equipped with earphone terminals (stereo mini-jack) and speaker. An optional network function allows previewing, streaming, and metadata editing of proxy images with a PC or Mac. Lens Files: Stores settings for interchangeable lenses. Eight files can be stored in the camera unit, and 64 (8 x 8) files can be saved on an SD/SDHC/SDXC memory card. Built-in GPS function enables positioning data to be saved onto recorded files as metadata. Built-in CC filters (3200 / 4300 / 5600 / 6300 K). Production support with Scan Reverse and 7-mode Gamma. USB 3.0 (Host) for high-speed copying to an external HDD. One-clip recording function records multiple cuts in a single clip. Loop rec, pre-rec, interval rec, and one-shot rec capability.